We promise we’re not jumping ahead to next winter. However, now is the time to really take a look at your garden and see what you can add to brighten up your space even in the dead of winter. Although flowers are few and far between, you can add interest in the winter with the textures of branches, a framework of trees, varying shades of evergreen and even windswept grasses. 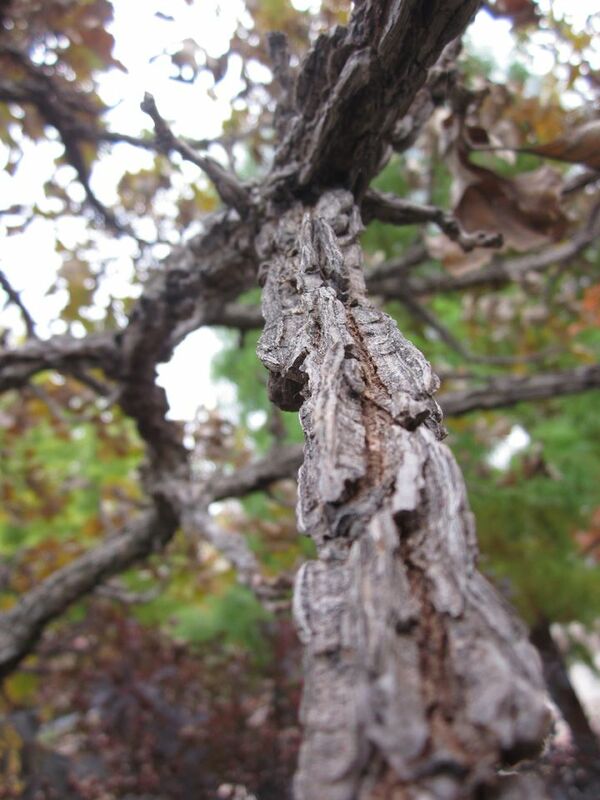 Close up of a Bur Oak branch. Color – Enliven your view and delight your eye by adding a splash of color. Greens - Evergreens come in many sizes and shapes but also colors. The crisp blue of juniper or spruce lends distance to your view. The bright gold of Gold Mop Falsecypress can cheer up a part shade corner. Some types of arborvitae shrubs turn rich orange for added drama. Groundcovers may be evergreen, too. Pachysandra’s glossy dark foliage stands out in winter. Ajuga’s dark burgundy leaves add interesting accents at the front of the border. Reds and yellows - Many shrubs such as yellow twig or red twig dogwood have beautiful winter bark that is especially showy in front of mature pines or spruces. Late winter flowers - Watch for early blossoms! Some hardy plants and bulbs bloom as soon as the temperatures rise regularly above freezing. It’s great fun to find the first flower of the year. Adding snowdrops, winter aconite, snow crocus, hellebores, witchhazels or Cornelian cherry dogwoods for a early bloom. Texture – Add interest to your view by combining different textures. Deciduous Trees - Their branches are bare but there are some trees with beautifully textured bark that can be a focal point. Add a Paperbark Maple (Acer griseum) with its wonderful peeling bark or a Bur Oak (Quercus macrocarpa) with its knobby, gnarled bark or even a Seven Son Flower (Heptacodium miconioides) with is shaggy red bark. Grasses - Some of our favorites include Little Bluestem ‘Blue Heaven’ and Panicum ‘Northwind’. Calamagrostis ‘Karl Foerster’ is another fairly common grass but it stands up well in the winter and because it is a cool season grass you will start to see new growth in late March. Mix several different grasses in the same bed for even more textural interest. Views – Take a moment to pay attention to your views indoors and out. What are some of your favorite views from inside? Are there picture windows that could use a focal point? A home office that needs inspiration? Kitchen windows that look out to an empty deck? Think about what sorts of colors and textures might enliven your view to the outdoors. Are there views that you do not enjoy? Winter can be a good time to notice areas where you may want some screening. Plants can soften unsightly views and disguise troublesome areas. Birds – Our feathered friends are attracted to different plants each season. In winter try to provide food and shelter. Birds are hungry in winter. Consider planting plants that produce berries and seeds such as crabapple, viburnum, chokecherry, ornamental grasses and junipers. It’s cold out there! Birds will frequently roost together in dense evergreen trees and shrubs such as yews, spruces and junipers. They also prefer dense shrubs as cover from hungry predators.